﻿This hurts me, but a bet is a bet and I keep my word, so here they are....Crimson Tide Cupcakes. The story behind these cupcakes is a simple one. First of all, for those that don't know me, I am an avid University of Tennessee fan. I love the Vols!! Always have. It's one of the many things that connected me and my Dad. I lost my Dad 6 1/2 years ago and I always tear up at the beginning of the game, when the Pride of The Southland Marching Band forms the Power T and the football players run through, but I know that Dad is there with me enjoying the game too. Okay, back to the story of the bet. My friend and fellow foodie, So How's It Taste? is an avid University of AlaDAMbama Alabama fan. She told me that if UT beat Bama, she would bake a UT themed item and in turn, if Alabama won, that I should bake a Bama themed treat. Well....here we are. The cupcakes were fairly easy. I used a boxed red velvet cake mix and I made buttercream frosting and tinted it gray. 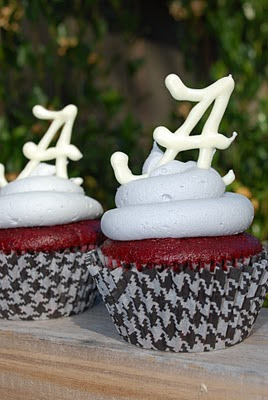 The houndstooth cupcake liners are from Bake It Pretty. The script A's are made of white chocolate. I printed off an image from the computer of the script A and placed waxed paper over it and traced the image with the melted white chocolate. That seemed to be the most difficult task, as I do not have the most steadiest of hands. So, Leah, here are your cupcakes. Now I'm going to go fix a drink (my traditional game-day bourbon & Sprite) and listen to Rocky Top!! These look awesome! 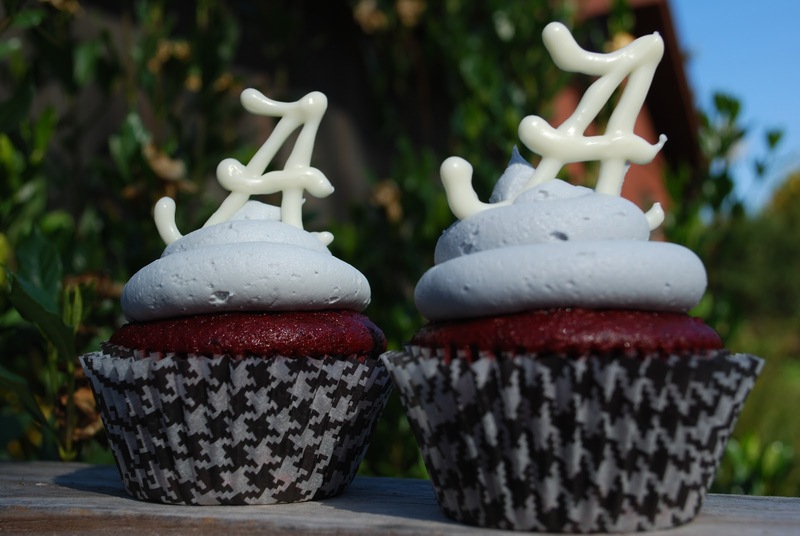 Who knew a UT girl could bake such marvelous Crimson Tide cupcakes?! I'm pretty sure I squealed like a 2-year-old when I saw them this morning at work! Thank you!...oh and Roll Tide! Wow, Shannon! Alabama may hire you to make these and sell. Excellent!I sure wish I could try one out! Enjoy! Funny stuff I became a follower please follow me too.